Briny Caper Tuna Salad Recipe | Good. Food. Stories. I tend to be a wee bit obsessive. Just your garden-variety wears-the-same-outfit-for-a-month, watches-eight-seasons-of-TV-in-a-week obsessive. You know how it goes: you find something and realize it fits perfectly with everything about you and so you must enfold it in your life. Well, for years, the caper was missing from my life and I didn’t even feel its absence. Sure, I’d eaten them on the odd deli bagel platter at relatives’ houses, but I’d never really considered them. Apparently, the caperberry was once thought to have an aphrodisiac effect; indeed, the Hebrew word for “caperberry” is similar to the Hebrew root of “desire.” The caper bush is commonly found in circum-Mediterranean countries (capers are the flower buds of the bush), so Mediterranean cuisine uses them liberally. They come packed in salt or in brine and both are delicious. Puttanesca sauce was my caper gateway drug and I have never looked back. The combination of rich sweet tomatoes, tangy garlic, and briny capers is something I crave at least once a week. But what about recipes that don’t usually call for capers? Over the last two years I have begun systematically adding capers to any likely dish—some just to see when the caper will finally fail me. And you know what? It never does. The variation that I’ve gotten the most mileage out of, though, is a caper tuna salad. I’m always looking for easy ways to get good protein and, because I live alone, it can be hard to buy meat or fish when I go grocery shopping because don’t want it to go bad. 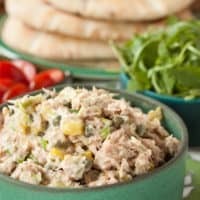 Tuna salad is a great solution to the problem because it’s quick to make, extremely inexpensive, and versatile: you can use it to make a sandwich, put a scoop on a salad, or snack on it with veggies or crackers. My only issue with tuna salad is that it’s pretty dull. I mean, after age five, once I wasn’t eating it in the form of a tuna boat anymore, it pretty much lost its appeal. But this recipe has completely invigorated tuna salad for me. While you can still stick it on a sandwich or salad, it’s actually flavorful enough that I have no problem eating it on its own, something I’d never do with plain old tuna and mayo. The briny flavor of the capers goes exceptionally well with the fish, and using a little bit of the caper brine cuts down on the amount of mayonnaise you need to use (I’m not a big fan). I use brine-packed capers for this reason, but I bet the ones packed in salt would be great too. If you use those, just omit the salt from the recipe below. I really like to eat this caper tuna salad on top of sliced grape tomatoes and arugula or with some toasted pita points. If I’m feeling really fancy, I’ll brush the pita with olive oil and sprinkle on some salt, pepper, and thyme before I toast it in the oven for about ten minutes. It also makes for a killer tuna melt; I like it with thick wheat bread, thin-sliced tomato, Havarti cheese, and a piece of crispy bacon. Capers, scallions, sweet pickles, and garlic make this caper tuna salad the best and briniest you'll ever eat. Not kidding. 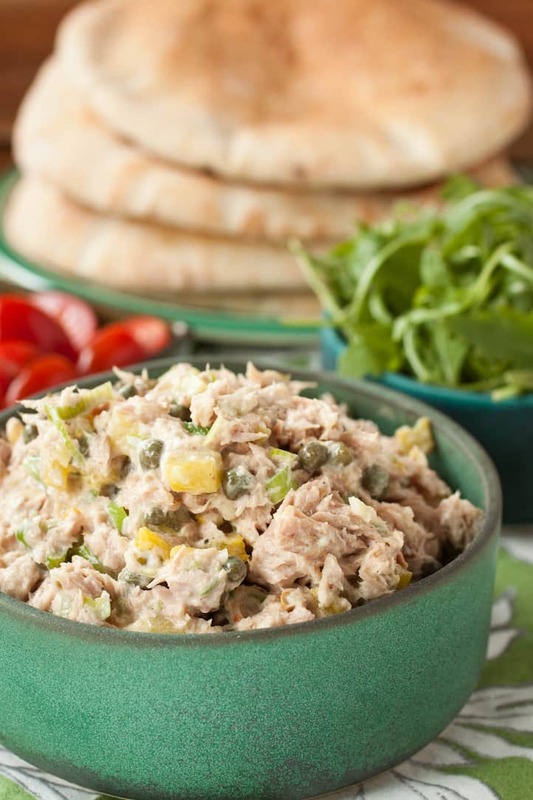 Mix the tuna, mayonnaise, scallions, pickles, garlic, and capers in a medium mixing bowl. Mix in the caper brine to loosen the tuna salad to your preferred consistency. Add the salt, pepper, and red pepper flakes to taste. Tinker until it’s your own personal briny perfection! 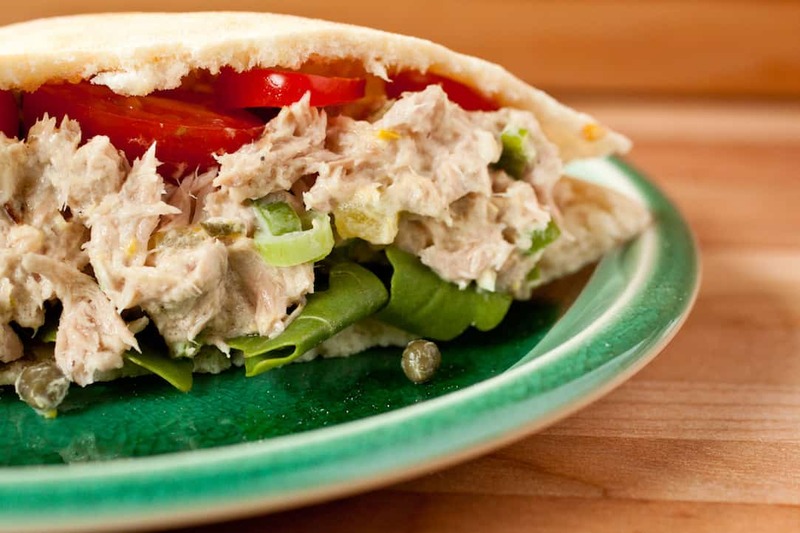 Stored in an airtight container, the tuna salad lasts up to a week in the fridge.